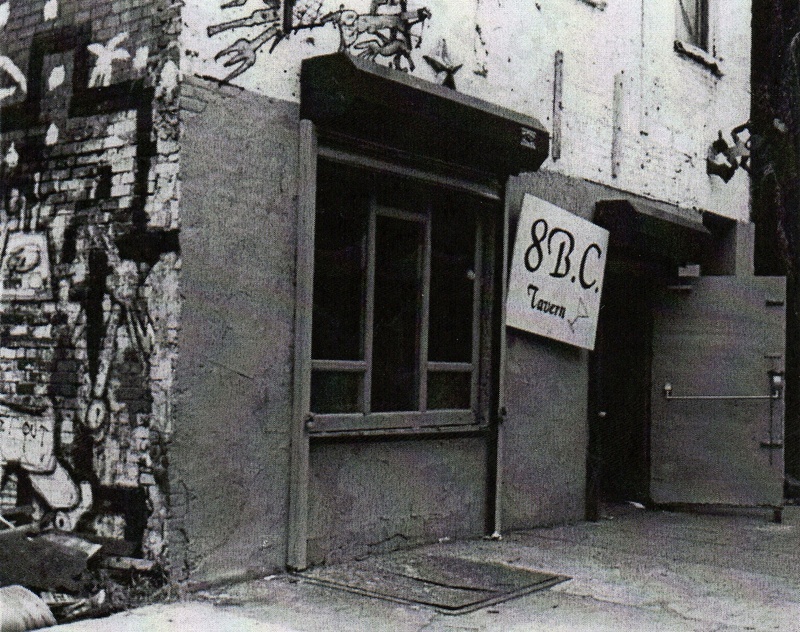 Before wine bars, bank branches, and sushi restaurants took over the East Village, there were hole-in-the-wall clubs like 8BC, a gallery and performance space on Eighth Street between Avenues B and C. Opened in 1983, the place was over by the end of 1985. The club is long-gone, but the tenement building still stands today. Of course, the art and graffiti has all been cleaned off and the facade spruced up and bricked over. And instead of empty lots, it’s flanked on both sides by gardens. This entry was posted on May 6, 2009 at 2:53 am and is filed under Bars and restaurants, East Village, Music, art, theater. You can follow any responses to this entry through the RSS 2.0 feed. You can leave a response, or trackback from your own site. i wasn’t in 8BC, but was in some of the others. No nostalgia for me–I was just a little kid when this club was cool! Were you part of the KS Art exhibit? ok so i’m old enough to remember – the fabulous owner trey – karen ann finley and lots and lots of gggggrrrrrrrrrrreeeeeeeaaaaaaat weird and wonderful performance art and muzak. thanks so very much for posting this. shout out to anyone who ever performed or saw a great band or just hung out and drank. Good memories! I miss those days when chickens freely roamed the stage and the audience…! not part of it no, but i recognized all the performers, having seen them multiple times in these rooms. i was at squat more than anyplace else – not downtown, but had many of the same players. Don’t forget Dana Southern! He’s an old friend of mine who had a hand in 8BC. Very wild atmosphere. Wallpaper was old newspapers from the 1800s. I believe he’s married and lives in China as an English teacher. Fond memories of playing 8BC with Band of Outsiders. I remember 8BC from the early 80s. There were dirt floors and dozens of inflatable Ronald Reagan dolls on one wall, and chipmunk lamps on the tables. On the other wall there was a painting of Greek women struggling to hold up a building (like Doric columns) as wild wolves tore at their feet. It was called “Civilization Teeters”. Everyone thought that civilization was ending, at any day. We would be bombed by the Russians any minute. So we partied. The main band was They Might Be Giants, but we never got that far because the AC broke and the wife of the Japanese postdoc in our group fainted from the heat. We heard a violin and viola band play a great cover of “kashmir” by Led Zep tho. On the way out, you could see grafitti by Haring and Basquiat on the walls etc. It was wonderful and terrifying both. Worked for the Kaiser, eh? Quite an evening – nothing like trying to hail a cab late at night on Avenue C while working to settle down some poor Japanese girl who had no idea what she’d wandered into – almost as scary as the walk through Tompkins Square Park getting there. The name of the violin and viola band that played Kashimir was The Ordinaires. Thanks for sending me on little Google Street View adventures. It looks like that building is gone, though, not just changed. The current structure appears narrower and if it’s not a complete destruction and rebuild, it might as well be, judging from the exterior appearance. It’s too bad NYC doesn’t list “year built” in their property database. One of the great paintings at 8bc was a huge depiction of Pompeii with a volcano bursting and women in togas being chased by wolves… Don Herron was the artist – he was (and maybe still is) capable of fine technical work (commercial stuff by silk screens) but he also had a whimsical side – dark and funny. I recall the night Ethyl Eichelberger did King Lear, playing all the roles (with costumes on rope – he’d lower one and say a few lines, then lower the one for another character); and all the while making hysterical asides. Does anyone know the exact address? Do any of you remember that there was an old synagogue down the block, closer to Ave B? Thank you. Also on google images I found posters of shows from 8BC (Ed Gein’s Car, others) that showed the address. 317 E 8 was an old synagogue. I wouldn’t call 8BC a “hole in the wall” – it WAS the wall. They owned the building, it was a pretty big space, and it was the only thing over there for a long time. Fantastic place, one of the best clubs ever in New York. Yes, it was big. I believe the ground floor was missing (torn down or fallen down) and the club started on street level by stairs down to what was the basement. It gave the space an open feel — since with the floor missing it was 2 stories high. And it probably filled the entire floor length and width. And, yes, fantastic — not just in hindsight. I always had a great time there even though whether the performance was Shakespeare or a tribe of East Village in women grass skirts playing bongos (or both, on the same night) I never knew in advance. I did a serial at 8 BC called “The Onyx Fool”. And as others on this thread have mentioned, it was a large space, not a hole in the wall. And specifically the stage was gigantic. There was probably some previous use as a loading dock. Whatever, it went on forever in the back (there was no set backstage) and you could use as much of it as you wanted for each show. That wasn’t a stage. It was the remainder of the main floor. It meant the stage was 8 feet high, and when performers receded in the distance you could not see them, which provided for some whimsical staging. Most nights included a band and some kind of whacky performance art. It was my hang for a while and I donated a LP gas space heater because in the winter it was so cold that guitarists hurt their fingers. Hey, my band Zone played there a bunch of times. It was a great place to perform. Love finding this photo. (We also performed at CBGBs, Danceteria, Pyramid, Peppermint Lounge, & the Thomkins Square Park Festival. Totally exciting times for downtown music in NYC.